`Hello I am Garry Walton 67 from the UK. I am researching a member of my family in SA. My great Uncle Ernest Ambrose Walton was reported killed age 25 in Basutoland on 19th October 1890. The obituary in the Manchester Times says he was with the 1st Kowie Yeomanry and killed in The Basuto Gun War. I know that the some of the relief column travelling to Mafeteng were ambushed and about 30 killed on that day. The Kowie troops appear to have been absorbed into the 1st Cape Mounted Yeomanry. So the obituary may be confused. I cannot find any information about his burial or medal awarded to him. While there are 3 Waltons, none appears to be your great uncle. I had a look in The Times and there is very little information. This from 14 Oct 1890. A newspaper account of the action on 19th October 1880 near Kalibani Hill prior to the relief of Mafeteng. No list of those KIA or wounded on 19th October. There is a page on The Basuto Gun War 1880 but no mention of my uncle. Hope at the utterances of portions of the London press with respect to the Basuto war. It was quite uncalled for that the leaders of public opinion at home should express their conviction that the war has resulted from the land greed of the colonists, or a wish on their part to interfere with the rights to which the Basutos are entitled. It was also ungenerous to say that the colonists would be unable to enforce the laws they had made, and to hint that when British troops have made an end of the war the colony must be deprived of some of the powers which have been entrusted to it. The statements were uncalled for and ungenerous, because they are untrue. Almost any sacrifice will be made by the Cape rather than it should be called upon to part with any of the privileges which have been conferred upon it. Considerations of this kind give an importance to the present struggle which cannot be overstated, and as the eyes of the colonists are. fully open to the fact, it was extremely unkind for the likes of The Times and St. James's Gazette to taunt the colonists with rashness and imbecility. As far as the war has proceeded the advantages have all been on the side of the colonists, and when it is found in the old country, as I confidently hope and believe it will soon be found, that the Cape is more than a match for the native tribes on and beyond its borders, the people in England will not be slow to admit that they have under estimated our love of representative institutions, and our desire to rule our coloured neighbours firmly but justly. Before proceeding to give an outline of the operations of the last fortnight it may be interesting if I give you some information with respect to one or two of the most prominent men amongst the rebels. Lerothodi, whose name I mentioned in my last in connection with the then recent attack upon Mafetang, is a son of Letsea. He is between 30 and 40 years of age, about 5 feet 10 inches in height, and is described as a stout well-made man, but with a bloated and forbidding countenance. Lerothodi has received little or no schooling, and only speaks In his native language, with the addition of a few Dutch words. He is extremely taciturn, but has a high character for courage amongst his own people. As the leader of the young party amongst the Basutos he carries great weight in the councils of the nation. Lepoquo, the eldest son of Masupha, who has been seriously wounded in a recent attack upon Maseru, is about twenty- three years of age, five feet f even inches in height, and is possessed of an intelligent countenance. He was educated at a Kafir College, founded by the late Bishop of Cape Town, in this city, and speaks English well. He is well known for his pluck, and is an ardent admirer and no mean performer at the old English game of cricket. Masapha Lepoquo’s father is a celebrated Basuto warrior, and bears a reputation for cruelty unequalled by that of any of his adherents. During the war with the Free State, in 1865, he led a party which made a raid upon a number of Bastaards, under a flag of truce, and cruelly murdered the whole, men, women, and children. His village is situated at the foot of Thaba Bosigo, and has been strongly fortified, and some hard fighting will probably take place there. As another matter of interest I may mention that the Basutos have for years been acquainted with the art of making gunpowder, and that the villainous compound was largely used by them during the war of Morosi. The Basutos prefer powder of European manufacture, which burns much more freely than that made by themselves, bat when their purchased ammunition has been expended they are not altogether without the means of doing mischief. Aliwal North, Saturday, October 9, 1880. After a miserable voyage and a long march, we arrived at Aliwal North yesterday. The march has been a very hard one, over mountains with out number, through the rain, mud, wind, and dust. It is indeed a very hard life. On Thursday day morning we struck tents at 5 a.m., and commenced marching in our yellow corduroy suits. We were not long on the road when a thunderstorm overtook us, which lasted for five hours. We were all drenched to the skin. It was indeed a pity to see us, we could scarcely move along, so cumbersome were the clothes, which stuck like glue to out bodies and dyed it with a colour like yellow ochre. I never felt so miserable before. It thundered and lightened without mercy. The men were slipping on the road, falling in the mud; others scarcely able to move, others falling, down, and others pushing ahead as fast as their legs could carry them. The whole column was broken, which reminded me very much of the Turkish retreat from Plevna. The wagons were some hours in rear of us. We had very little to eat the previous day and very little the morning we left. Before 1 o'clock we marched more than eighteen miles over a very ragged and bare country. You can fancy our dilemma: imagine us marching for five hours in a thunderstorm; indeed we were a miserable little army that day. If the Basutos, or any other tribe, had attacked us we would all have been massacred. The men were marching along in groups of tens, fives and so forth. About 2 o’clock the storm abated, and we had to wait a long time for the baggage, commissariat, and ammunition train. After the storm the sun shone with au awful heat. We soon had something to eat, and changed our clothes; then commenced our march, again. That day we covered more than twenty-one miles of ground, such a rugged and stony road too. Next day we reached Aliwal. At the outbreak of the war Colonel Wavell, who commands the Cape Town Volunteer Sines, was in England, but as soon as the intelligence reached bin he took passage tor the colony, and has since arrived and has proceeded to King William's Town, where he will remain in charge of the base. It is very unfortunate for him that he should have been away when the drafts from his regiment were called out, the more so as he only took up the appointment a few months ago, and sanguine people say this will be the last native war the colony will have for a generation. On the 10th instant a determined attack by a large, number of Basutos was made upon Maseru. several other buildings, and carried off large quantities of commissariat stores, and the stock, in-trade of two or three traders. Our men fought bravely, and with the aid of a twelve pounder which they had with them inflicted heavy losses upon the enemy. During the night our men were at a great disadvantage owing to the darkness which prevailed, and in order to lessen this a building, which had been erected for use as an hospital, was set fire to and burnt down. The loss of the building was a serious one, but it was more than counter balanced by the injury the light enabled our forces to inflict upon the enemy. It had the effect of convincing the Basutos that their efforts to take the place had failed, and they withdrew to a safe distance. Our losses during the engagement were confined to two or three men who were wounded. At Mafetang Colonel Carrington has been doing good service. He was completely surrounded, and could only communicate with the camp near Wepenar by means of signals and native runners, and finding that the enemy was slow in attacking the position he determined to prepare a surprise for them. A small party of scouts accordingly left the fort, and moved in the direction of the enemy's position. A brisk fire was kept up on our men, and when the Basutos had warmed to the work the retreat was sounded, and our men galloped back as if seeking cover. The movement had the desired effect, and the rebels seeing our men in full retreat followed to the number of about 1,500, but had only got over a portion of the ground between their position and Mafetang when they received volley after volley from the advanced positions the garrison had occupied, and the attacking force was utterly routed. The investment, however, was kept up, and in the absence of the necessary supplies our men were compelled to kill and eat some of their, horses. Meanwhile active measures were being taken to relieve Mafetang, and the colonial forces were being pushed forward with all possible speed for a camp which had been formed in Basutoland within a very short distance of the Caledon river, and only some half dozen miles from Wepenow, in the Free State. On the 19th instant a forward movement was made into the enemy's country. The column consisted of sixty-five officers and 939 men of the Cape Mounted Rifles and Yeomanry, and. twenty-two officers and 552 men of various corps of Volunteer Rifles. Mafetang, October 19. — The troops under my command, numbering 101 officers, 1,495 Europeans, and 75 natives of all ranks, moved from their, camp at Massayne's Farm, near the border, at a quarter to 5 this morning, and proceeded without much opposition as far as the Kalabani Hill, a small height on the road, which was taken possession of by the Cape Mounted Rifles, which enabled the waggons to pass the Poort between Kalabani's village and Kalabani. The enemy at this time appeared in some force to the northward, but were driven back by a few well directed rounds from the seven pounders. Nothing at this time appearing on our left, I directed the main body of the 1st Yeomanry, who were in immediate advance of the waggons, to move to the left of the ridge of Kalabani to feel for the enemy in an easterly direction. Captain Dalgetty, the ‘adjutant, was in command, Colonel Brabant being at the time in charge of the advance. The men had not proceeded far from the main body when they were charged by a large body of Basutos who came down at full speed over the rise. A hand-to-hand fight ensued, in 'which the Basutos, being armed with assegais, succeeded in killing twenty-four of the 1st Yeomanry. The 2nd Yeomanry was sent to their assistance, and the enemy was driven back with, I am informed, considerable loss. The enemy appeared in large force afterwards on both flanks. Those on the left were driven back by artillery fire, and those on the right never came into action. The number of natives about is estimated at from seven to eight thousand, but the greater portion never came under fire at all. At the time the waggons were waiting near Kalabani for the killed and wounded of the 1st Yeomanry to be brought in, a charge was made on the right front by a party of three to four hundred Basuto at full speed, which was checked by a well directed volley from two companies of the D.E.O.V.B. Leteea, and the force was composed of Nquebe and Bereng's men. From the prisoners taken I learn that the following chief s and their men were engaged Bereng, Mama, Leiso, Mogola, and that Bereng's son led the charge on the Yeomanry. The casualties, 31 killed, one died of wounds, 10 wounded. 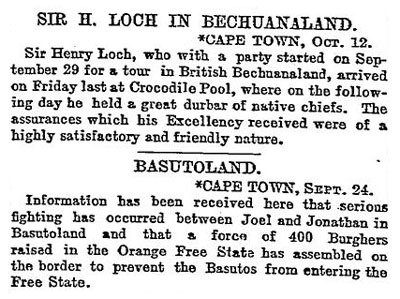 The above despatch conveys only a very scanty outline of the events which followed immediately after the departure of the colonial troops from their camp, but from a letter from a war correspondent of the Cape Times, which has been published, it would appear that a crushing blow would have been administered to our men except for their coolness and courage. work of a few minutes, and reinforcements having been hurried to the spot the Basutos retreated with heavy losses. In order to explain the very severe blow which the enemy was enabled to inflict upon our side, it must be remembered that the Yeomanry are merely armed with carbines, and are not supplied with revolvers or swords. In a sudden dash like this, our men having discharged their pieces; had no opportunity of reloading, and were completely at the mercy of the enemy, One trooper who had provided himself with a long knife made his escape by stabbing two Basutos with it. This defect in the arming of the Yeomanry was pointed out months ago, and during the last session of the colonial Parliament' a debate arose in the House of Assembly upon a vote in the estimates to supply the deficiency. The item however was struck out, and the anticipated results have followed. Carrington's forces have now formed a junction with the invading army, which is thus raised to about 2,000 men, It is opposed by from 8,000 to 9,000 of the rebels, and under these circumstances Brigadier-General Clarke, has telegraphed to the Government for reinforcements. In response to Peal the Burgher law has been proclaimed in several divisions of the colony, and 2,000 men have been called out for active service. Some companies of volunteers are being raised at various points, and the universal opinion is expressed that the rebellion must be put down at once and for ever. Clarke, having relieved Mafetang, continued his march to the eastward, and has engaged and defeated the Basutos near Lerothodi kraal, and has burnt down the village. The following is an extract from the despatch of the commander, in which he reports the particulars of the engagement. October 22nd. — Leaving the lasger near Mafetang protected by the three Yeomanry regiments, The Kimberley Horse, and The First City Volunteers (Graham's Town), I moved the remainder of the force soon after 3 this morning, augmented by all the men that could be spared from the garrison of Mafetang, against the village of Lerothodi, situated on a strong mountain position, some three miles distant. The force was placed under the command of Lieutenant-Colonel Carrington, Cape Mounted Rifles. Daylight broke as we approached the village, and the rebels were thereby enabled to occupy it in sufficiently strong force to prevent a surprise, which was nearly effected. The troops gained a rocky plateau some 900 yards from the neck on where the village is situated without loss, although the natives held it in some force, and I cannot understand how they allowed us to gain this ground. The rebels were seen hurrying in large numbers from all parts of the country, and shortly held the village in strong force. The 7-pounder gun and two 5-inch mortars were dragged up to the plateau we had s gained by hand, and the fire from the guns soon drove those in the open to a respectful distance. As large numbers had occupied a rocky gorge on our right, in which they were secure from our fire, it was not deemed advisable to carry the village by a direct attack, and the Kimberly Horse were, soon after eight, sent for from camp as our numbers were scarcely adequate to the storming of so formidable a position they arrived at ten o'clock. The rebels on our right had by this time also taken possession of a dry sluit from which they supported those in the gorge. which was attempted by the O.M.B. and the P.A.V. Guard (Port Elizabeth), but their strength was not sufficient -for the purposes This party was then reinforced by portion of the Cape Town Volunteers. The whole then led by the C.M.B. under Capt. Sherrington, charged the sluit across the open ground in the most gallant manner, driving the enemy from it. The rebels in the gorge, seeing their flank was in danger of being turned, evacuated it, and were punished severely they left by a heavy fire from the gun and the small arms of the troops on the plateau and the flat below. It was then determined to carry the village by a direct front attack, which was made with entire success by the troops on the plateau, and at 1.30 the village was in our possession and the rout of the enemy complete, The prisoners were taken, from whom 1 hope to procure some information. The natives must have suffered severely, although, owing to the rocky nature of the ground, and the distance at which some were killed by artillery fire, I cannot give accurate numbers, but I know of thirty-one dead bodies having been counted. G. Kippers, D.E.O.V. R. severely, O.M.K. Lieut. McMullen ; P.A.V. G.
Private P. Takes ; slightly, C.M.R. Privates R. Wells, B. Wrankmore, and Phraser. Within the last few days the Tambookies inhabiting the country to the south of Basutoland have also committed themselves to the same cause, and their example; has been followed by the Pondos, of Griqualand West, and the latter have murdered their resident magistrate, Mr. Hope, and three of his clerks, in cold blood, and have cut the telegraph -wires connecting the colony with Natal, England, and other portions of the world. From a statement which has been made by a missionary, who made his escape from a camp which, had been formed within a short distance of Umtata it appears that Mr. Hope and other Government officers were invited to be present at a native dance, and while it was going on they were suddenly attacked and stabbed to death. Up to time at which the bearer of this intelligence left the spot Umtata had not been attacked, but the rebels were within six miles of it. Major Elliot, who did good service during the late Gaika - Galeka war, is at Umtata; and will no doubt be able to give a very good account of any parties of the rebels he may come across. avoid it, but it is mainly the Moleno policy which allowed the natives to purchase guns with the wages earned by them while working upon the colonial railways and in the diamond mines in Griqualand West. The trial of strength has, however, has come and as nothing succeeds like success the colony looks forward with confidence to the time when it will be fully rehabilitated by the whole civilised world, not even excepting the Spectator. Update. Ernest Ambrose Walton fought in the Basuto War. He was a member of the 1st Cape Mounted Yeomanry. Kowie Troop. He was killed on 19th October 1880. There were a total of 5,252 medals issued to 5,156 individuals, including 96 duplicate/triplicates. 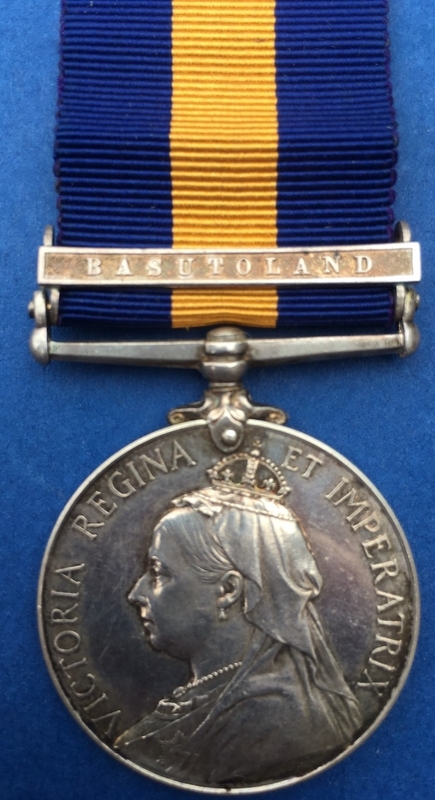 All medals were issued in silver to both whites and non-whites, medals were manufactured in England. Unbelievably the crown decided to award the medal only to survivors and not those who had given their lives to the cause like Ernest. I believe this terrible injustice should be corrected. Views?